Today, for a change we went out for breakfast but to somewhere completely different. 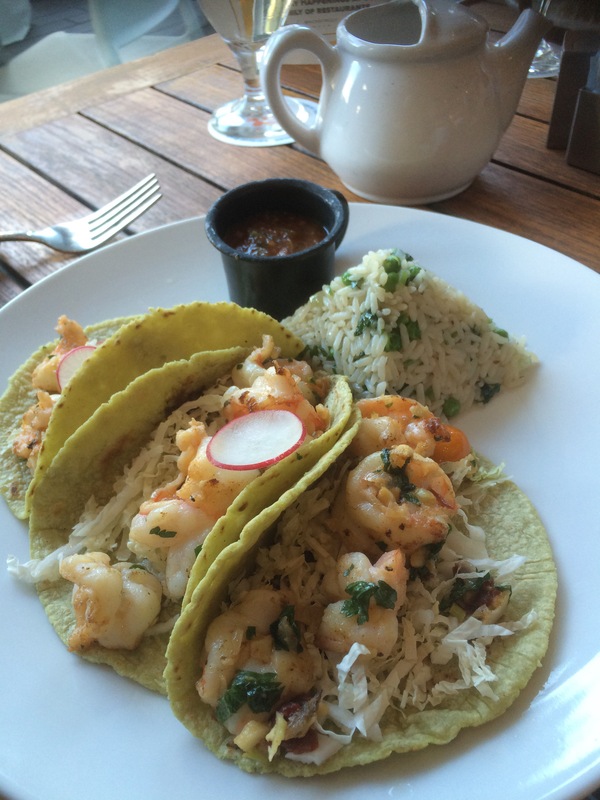 We went to El Moro in the central district of Mexico City. This establishment is open 24 hours a day and they only serve variations of Churros, hot chocolate ( and maybe the odd coffee)! It was found in 1935, by Francisco Iriarte,who had arrived in the city in 1933. Previously he had sold Churros from a cart in Spain and this he did in the beginning, in Mexico City but within two years he had bought the premises which now is the home of El Moro. 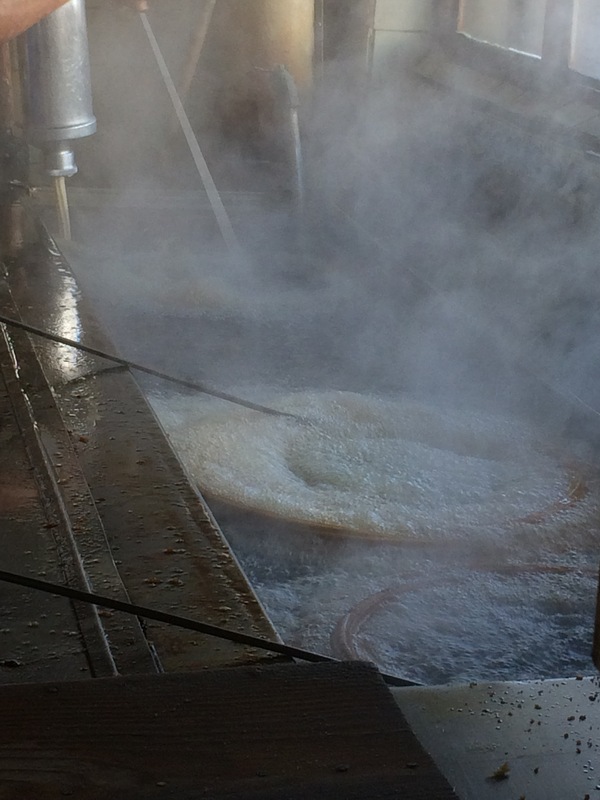 The operation is very simple, Churros, which are a form of doughnut, are pumped in a stream from a machine into boiling oil, twirled around to make a maze like structure and cooked until golden brown, about 4 minutes. 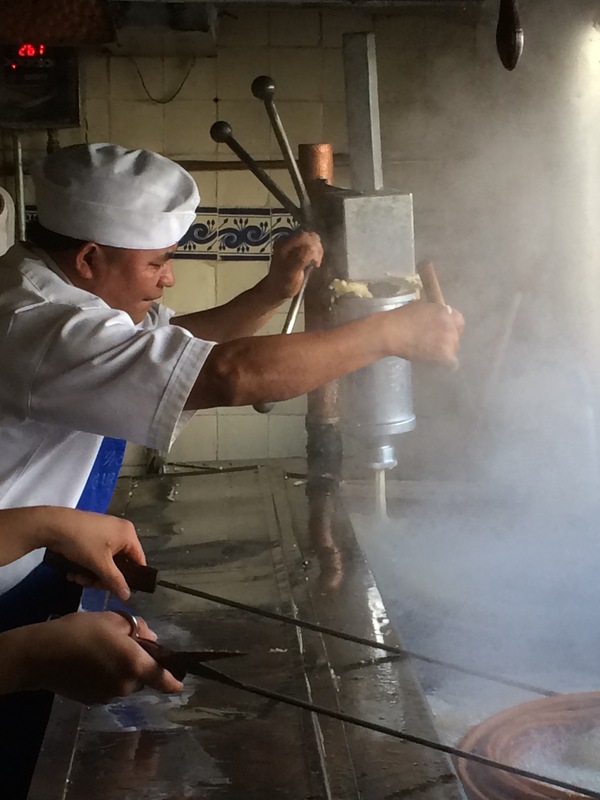 They are then lifted out with elongated chop stick like tongs, drained and then coated with sugar, either plain or cinnamon flavoured. Apparently Francisco died young but the business was run by his siblings and today it is Santiago,the grandson of Francisco, who runs the churrería. 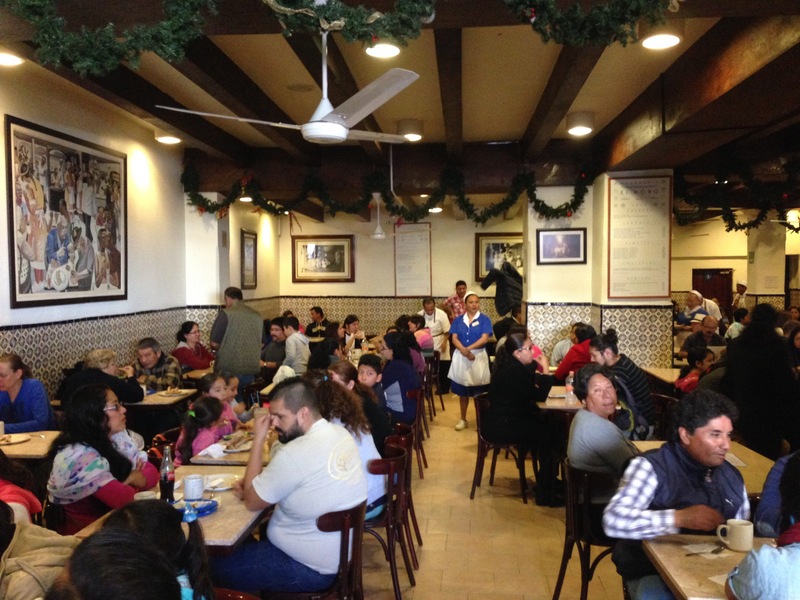 Santiago has expanded the business and now has three new branches one in the Mercado Roma one at Rio Lerma and one at the upmarket shopping centre Palacio de Hierro in Polanco ( the Mayfair of Mexico City ). 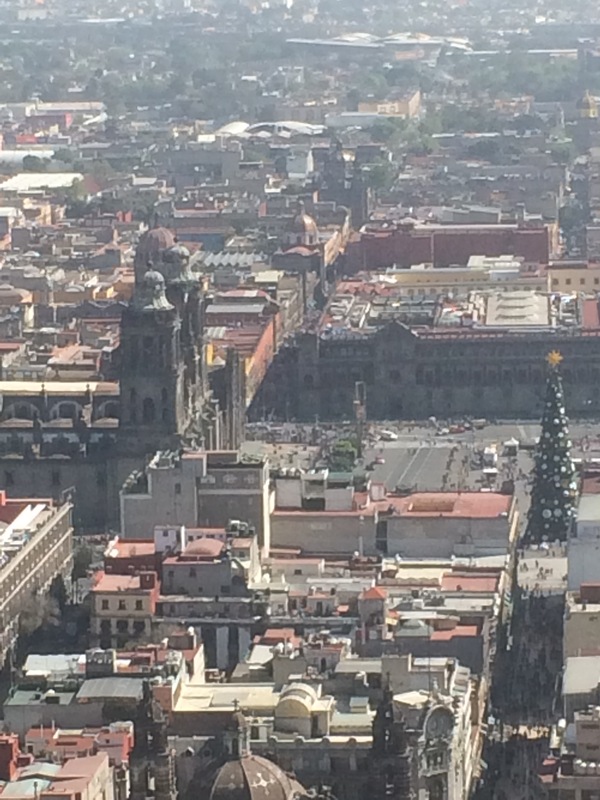 For Mexicans and tourists alike it is a must visit place ! 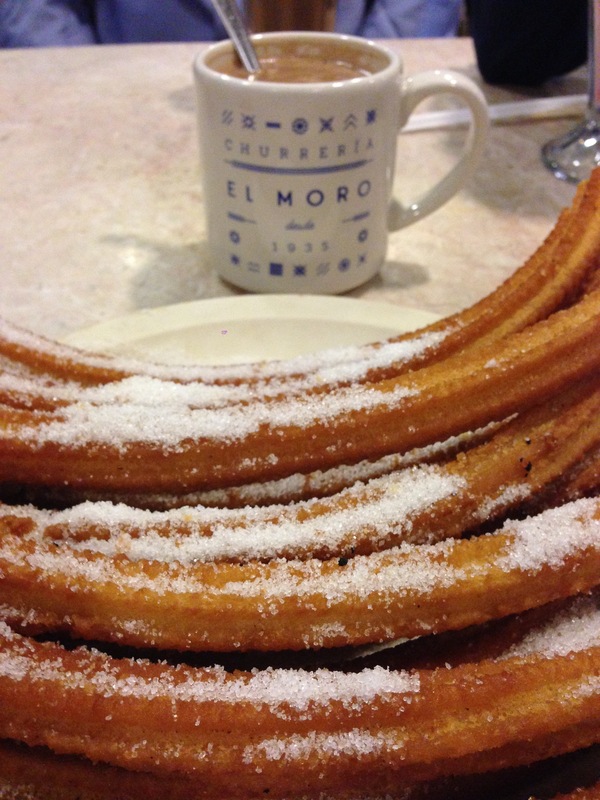 The way to eat Churros is to have a mug of hot chocolate of which there are several types to choose from. The one I favoured was the Chocolate light. We also tried the Especial and the Mexicano one of which was literally melted chocolate,so thick you could stand a spoon up in it ! Delicious for a sip or two, but not for a whole cup. 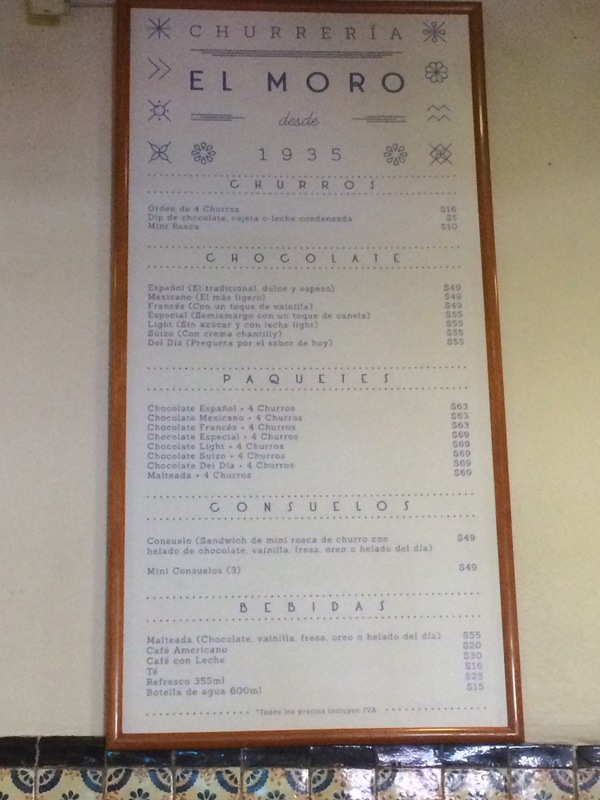 Alternatives for an accompaniment for the Churros one can choose, melted chocolate, condensed milk or nuts, or if you are really daring try the Consuelos which is basically a Churros ice cream sandwich ! It all makes for a really healthy breakfast !! The place is always crowded, usually having to wait for a table, and even those who want take away have to stand in line. 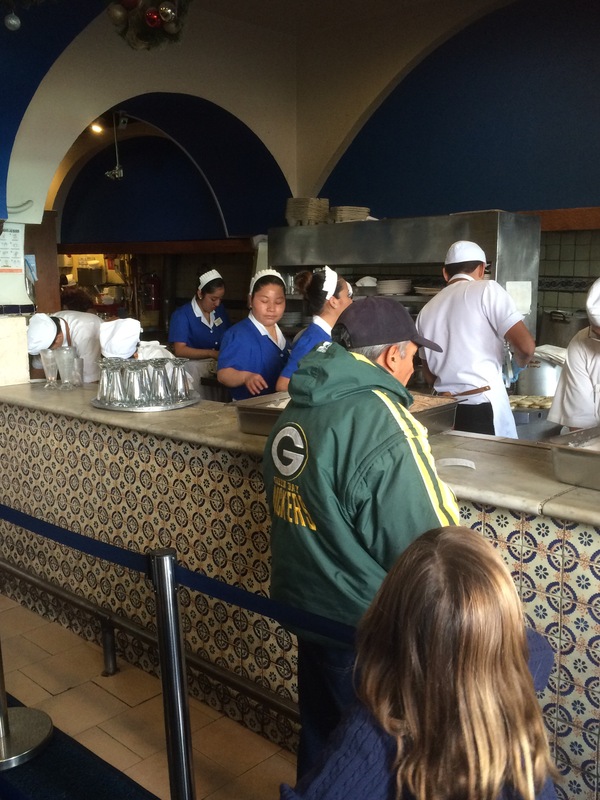 All of the waitresses are in a uniform of a bygone era, blue dresses, hats and white shoes. Following on from sugar overload, we visited the wonderful exhibition on the City of Mexico, which is a light and sound show over an amazing scaled model of the city, which took several months to build. From there we scaled the Torre Latin Americas up to the 42 nd floor, this was a great place to view the whole of the city. All of these activities should be included in any visit to the city. We also found a great boutique Bed and Breakfast hotel just around the corner! 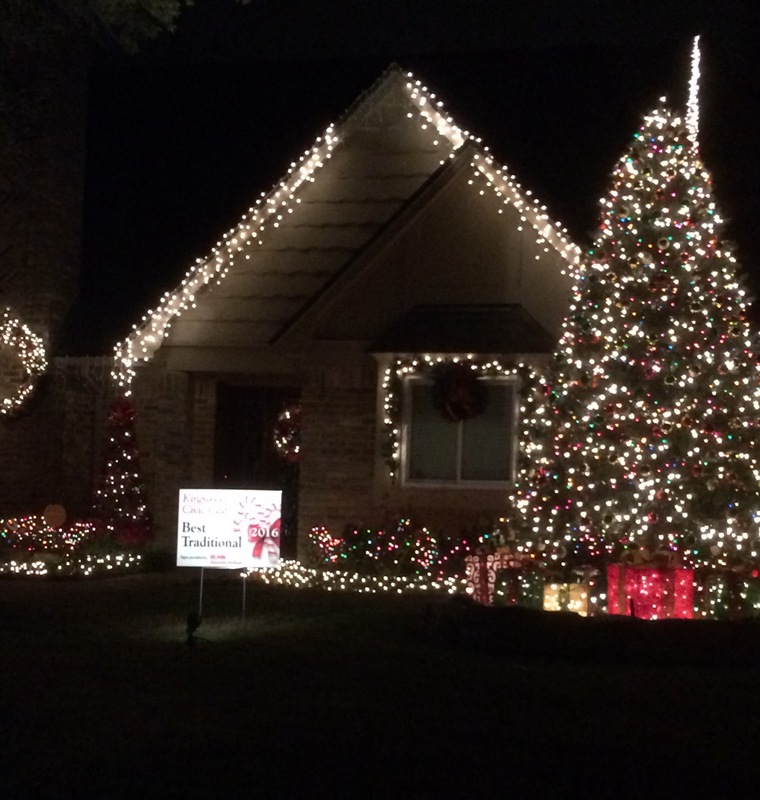 We were in Texas, for less than 5 days, but managed to eat out three times, which I suppose was not too excessive! Visiting old friends gave us all the perfect opportunity.‪ In Texas everything is bigger, even a simple Caesar Salad can be made using the heads of 4 Romaine lettuce, and that is just for one person ! Going out for lunch, we went to a Mexican restaurant in the Galeria area of Houston, Caracol, one of Hugo Ortega’s ( he has three or four in the Houston Area). 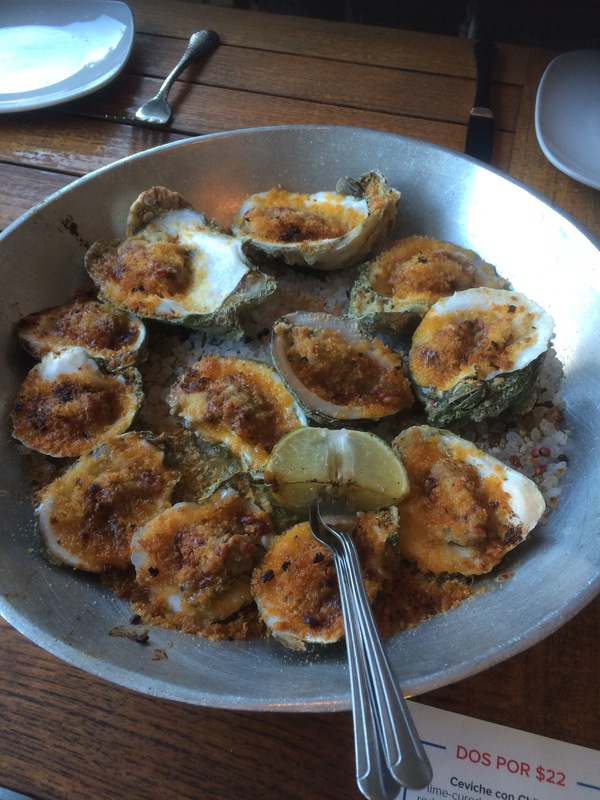 We shared a starter of baked oysters, oysters are plentiful in the gulf and cheap, on the half shell or baked. To bake oysters is really simple, drain them put on a dish and sprinkle in this case with Parmesan cheese, but add spinach and Worcestershire sauce and then you have Oysters Rockefeller. I just love oysters, on the half shell, in a ceviche or baked, any which way will suit me. In the UK where oysters tend to be expensive, I have found that in the Chinese supermarkets, they can be bought frozen, which are perfect when cooking them! 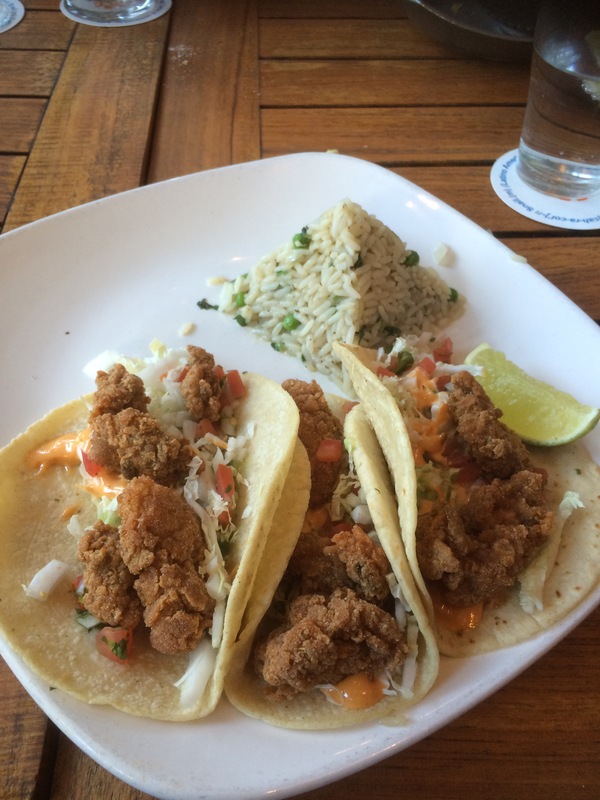 For our main course I chose Oysters again, this time as Oyster Tacos, but with fried oysters, Yummy could have done without the a pyramid of rice though! The following night we went local to where we were staying. The Liveable Forest, so named because when they started building in the ’70’s, they left most of the trees and therefore the animals, deer, amardillos, snakes and the like ( today they just plough down the trees when building a new area. 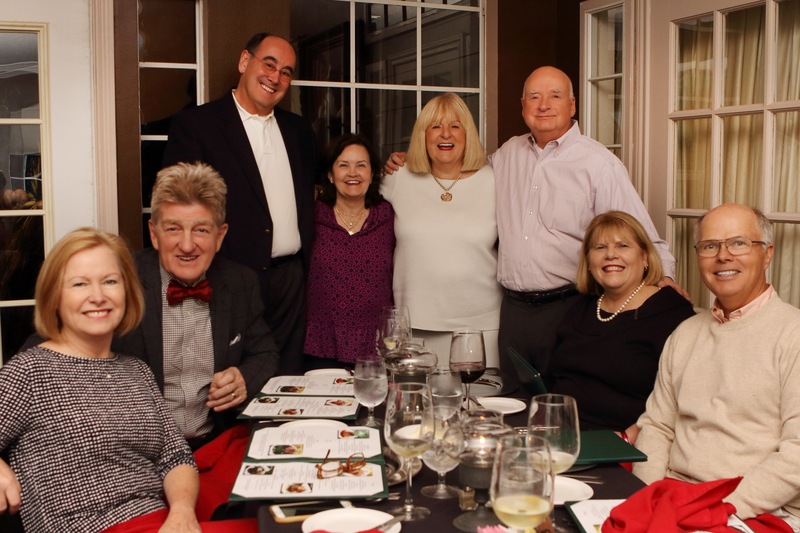 It was decided to eat in a restaurant called the Veranda, I would say that Kingwood, is not much different to many USA, sub divisions, most people want something fast and not fine dining. The Veranda, hits the spot insomuch as it is not a chain and is small. Fine dining, maybe it is not, but is good especially for a noisy group ( which we were). However on a Saturday evening, before Christmas there were only three other tables occupied. My friend chose a starter that had me baffled, it was called a Wedge Salad! Yes a Wedge! ( My grandson did suggest that it could give you a wedgie!) 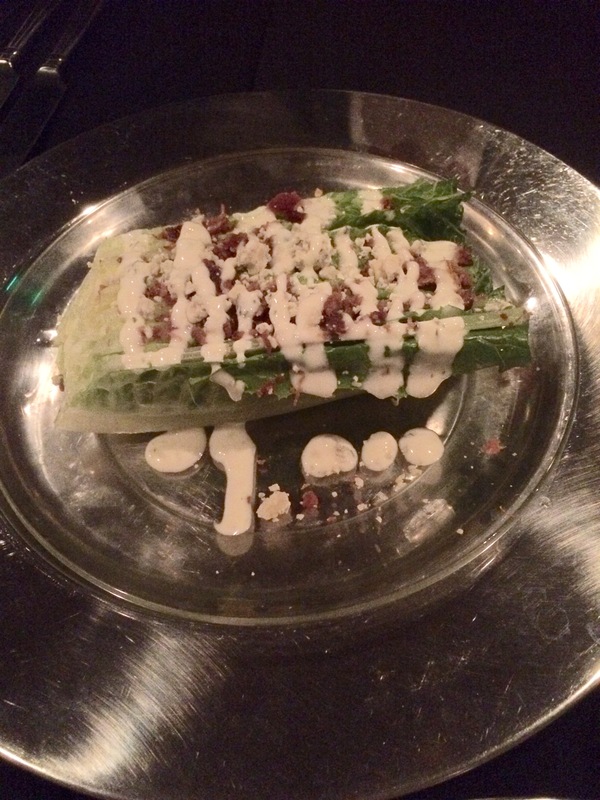 I could not imagine what it was, however, all it is, is a chunk of usually iceberg lettuce with blue cheese dressing, and bacon bits! 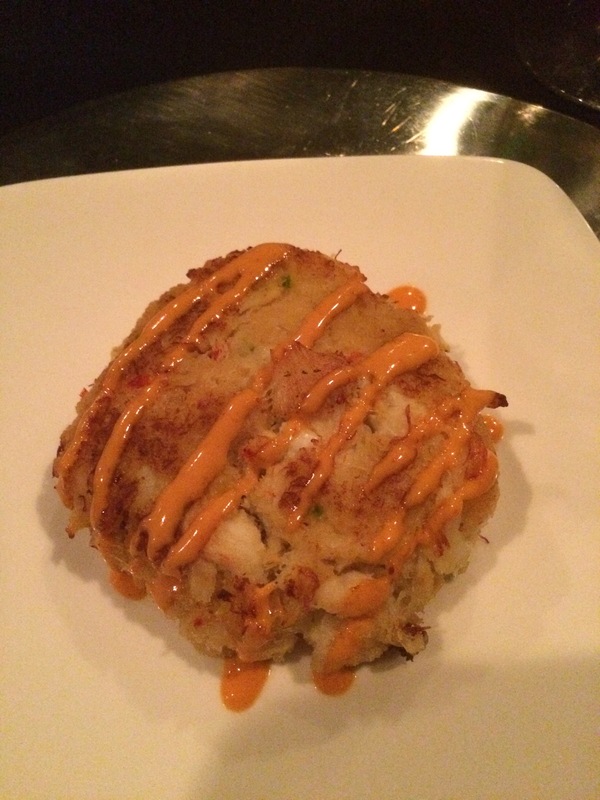 The girls all chose the Crab Cakes, which were mildly disappointing insomuch as there was too much potato in them. Usually in the States, especially the areas that have good seafood, crab cakes are made with lump crab meat, chopped celery, cilantro, chopped peppers and maybe some Chilies blended together with sour cream. 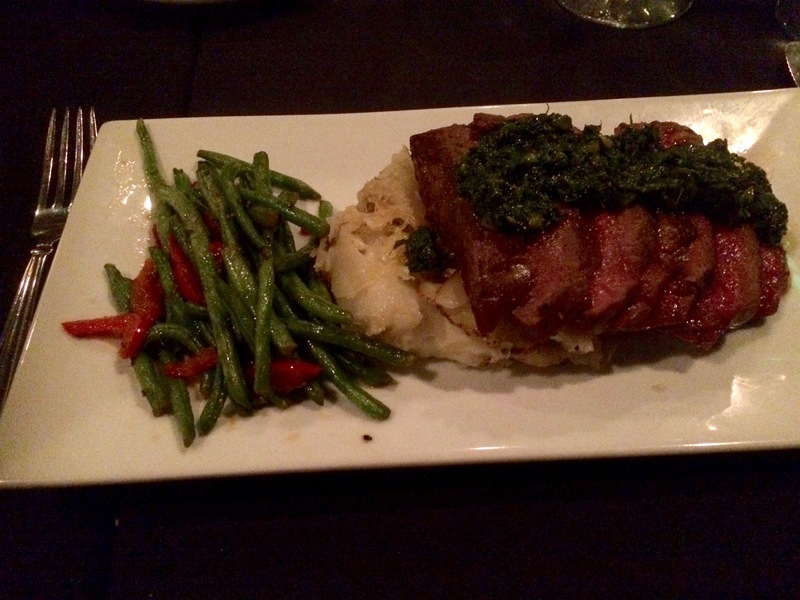 For my main course I chose Hanger Steak with Chimichurri sauce. Hanger steak is almost never to be found in a supermarket and might have to be asked for in a butchers. It is sometimes called Butchers Steak, as there is only one piece from each cow and is rich in flavour, hence the butcher might just keep it for themselves. In France it is called Onglet, in Spain and Mexico it is arrachera, whilst in Texas and the southern USA it is either flank or more often fajitas. Served rare to medium rare to avoid toughness it is a delicious cut of meat. small bunch parsley, roughly chopped, ½ tsp oregano preferably fresh but dried will do. 2 garlic cloves, crushed 1 shallot, finely chopped ½ tsp chilli flakes , 3 tbsp olive oil juice ½ lemon, 2 tsp red wine vinegar. To make the chimichurri, blitz the parsley, oregano, garlic, shallot and chilli flakes in a food processor , hand blender or chop very finely by hand. Add the olive oil, the lemon juice, vinegar and some seasoning, and blitz to combine everything to a chunky sauce consistency. Heat a griddle or frying pan and cook the steaks for 2-3 mins on each side or until done to your liking. Rest for a few mins, then spoon the sauce onto the sliced steak. 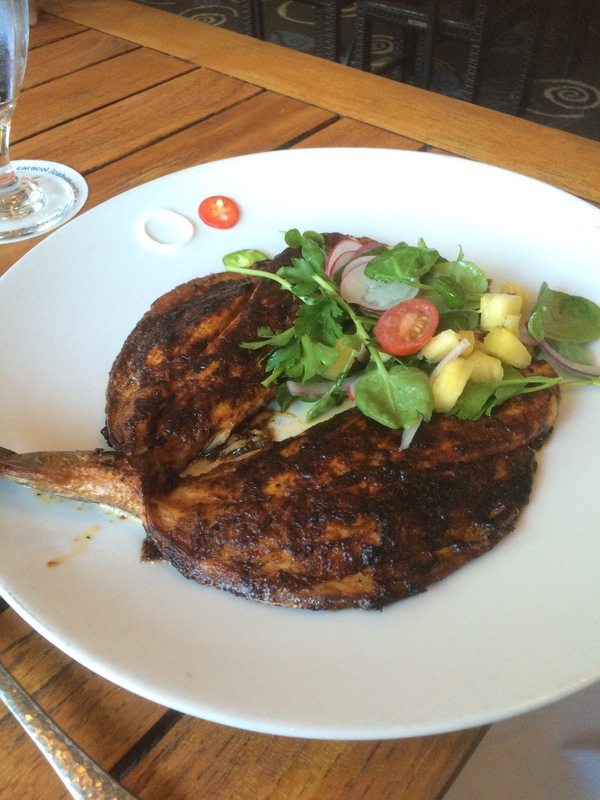 Serve with French Fries, creamed potatoes or baked potatoes and salad.